“I did not expect the overwhelming response online, it’s such a nice surprise,” the amateur fashion designer told Pear Video, jokingly adding that “I could probably get more likes and views online if I were prettier”. Even so, the 28-year-old’s video got over 5 million views in China and is now doing the rounds on western social media as well. 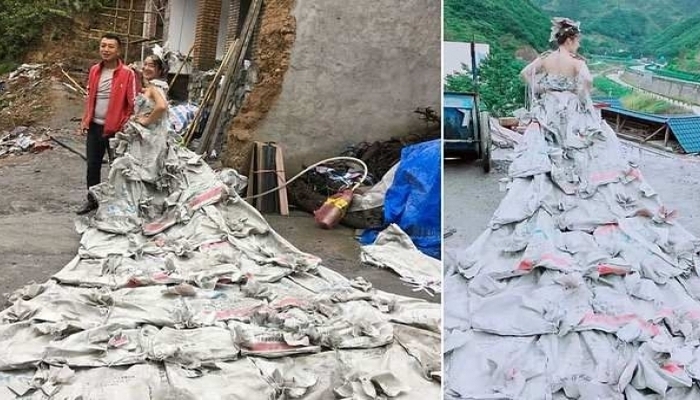 People just can’t get enough of her cement bag dress and accessories, and the fact that she created them all in just three hours, out of boredom, because it was raining and she couldn’t work the fields just adds to their charm. And just in case you’re wondering, Lilil Tan will not be using her unusual wedding dress at her own wedding, as she has been happily married since 2012, and also has a son.